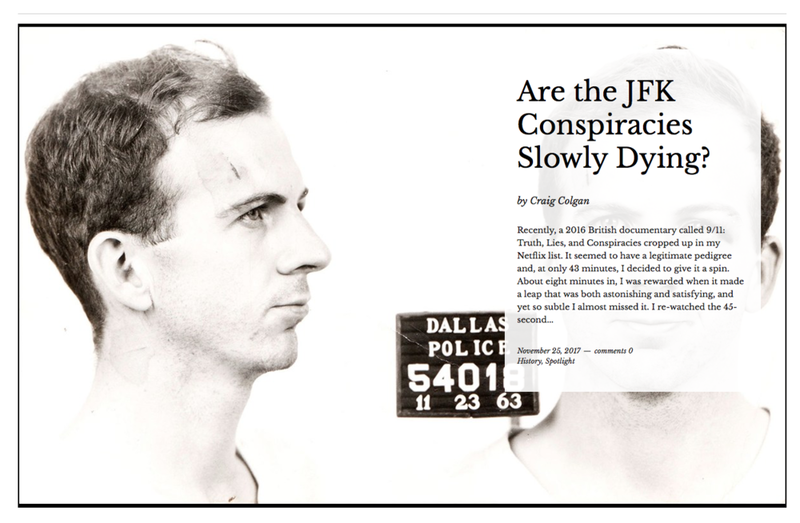 I wrote a 3,000-word piece for a newish site called Quillette, on a trend I had noticed among the recent news coverage of the release of government documents related to the JFK assassination. And that is for the first time, really, anyone who wants to learn about the case outside of reading government reports now has options, beyond reading works or watching documentaries by conspiracists. Work by anti-conspiracists has never been this prominent. This is important and new. I have been following the case since the 1970s, when I was a teenager, and I watched on TV the hearings of the House Select Committee on Assassinations. I read some conspiracy books, and one in particular caught my attention: 1981's Best Evidence, a stunning book by David Lifton. It became a bestseller. I fixated on this book's particular conspiracy thesis, and decided that was how the crime happened, and how it was covered up. Then I got older, and read more, and increasingly became skeptical of the skeptics. And this is really where the history of the case resides right now. The skeptics of the skeptics are as active as at any time. Their work is important and needs to be read. Fewer Americans believe in conspiracy that at any time since the early 1970s. Though news coverage tends to report that the country overwhelmingly believes in conspiracy, when the trend is in the opposite direction. I opened my piece by drawing inspiration from a 2016 documentary I had seen from ITV in Britain on the 9/11 attacks. In that film, one of the makers of a wildly popular 9/11 conspiracy documentary called Loose Change from 10 years before slowly backs down from one of that film's many controversial contentions. I wrote that this is what is going on in the JFK assassination case. The wilder claims had their day, in both instances. This is a new day. Yet you couldn't be bothered to actually interview me. Nice journalism. Sure, you know where to find me. I plan to do just that. I should have thought to get Avery's input. Another Twitter follower pointed me to a lazy episode of the CBC show The Fifth Estate from earlier this month. That show's conclusion: It's a coup! The show was pro-conspiracy from start to finish. It included at least one glaring error about how much time the Warren Commission claimed Oswald took to accomplish the shooting. Oswald, "said to be a poor shooter," the narrator intones. Wrong. This is a long-discredited pack of nonsense popularized in Oliver Stone's JFK. Oswald was not a poor shooter. Not according to his Marine records, anyway. But the show's major problem: Evidence of cover-up is not evidence of a plot to murder. And there is no evidence of plot to murder. A quote from FBI Director J. Edgar Hoover found in a recently released document is shown several times. Hoover writes, in the days after the assassination, that the public must be convinced Oswald is the lone assassin. Obviously before the Warren Commission had even begun its investigation. But this sentiment from Hoover and from the White House was already well known, from a similar quote from Attorney General Nicolas Katzenbach. Pro-conspiracist Jefferson Morley, who should know better, announces great import to the fact that "nobody in the car" believes the single bullet theory. A fact the Warren Commission of course knew and which means zilch. The show also conflates "the overwhelming majority" of American people who want to see all JFK assassination related documents released, with the reality that the trend line is going in the other direction, as I note above, when it comes to belief in anyone other than Oswald involved in the shooting. Several autopsy witnesses Lifton interviewed for his book are included, from decades ago. Several of whom I interviewed in 1993. None of whom convinced me of anything. One of whom contradicted what he told me when interviewed under oath by the Assassination Records Review Board several years later. Again, the point in my Quillette piece is not to take a stand on who killed JFK. It is to suggest that for the first time, a fairer picture can be assembled of the state of the case. Not only because we can now learn about the case from a broader universe of researchers and writers and filmmakers, who are not tied to conspiracy as default. But because after all these years, taking down inadequate work on the case, as I did above in a few minutes, is no longer a challenge. That's progress. I will update this post if any other reactions to the piece are worth discussing.